Today's conglomeration is comprised of mostly new stuff. I got a shipment yesterday after work that included some new dress shirts and one that included a new necktie. Still the same "old" gray sportcoat though. The dress shirt is a French blue, broadcloth straight collar. This one isn't non-iron. After wearing this shirt all day today, I'm officially done with most of the non-iron shirts. Oh sure, this one wrinkles fairly easily and I did have to iron it but that's a small inconvenience for the comfort. The non-irons are a bit scratchy and they don't breathe nearly as well. The necktie is a pretty special Jos A. Bank Signature Gold. Ebay strikes again. What makes this one so special is that they limit the number of ties manufactured for a specific fabric. Mine's number 205 out of 286. It says so right one the tie! These go for $135 brand new but mine was about $30 delivered to my doorstep. 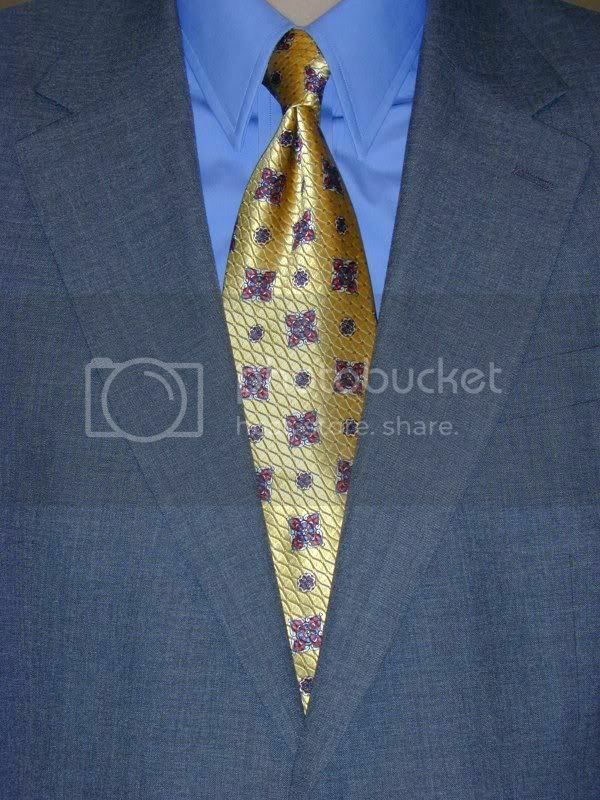 Four-in-hand knot once again for this golden beauty with red, blue, white and black shapes. Robert Talbott individually numbers their Sevenfold line. They only make 40 of each pattern so they're more special I guess.